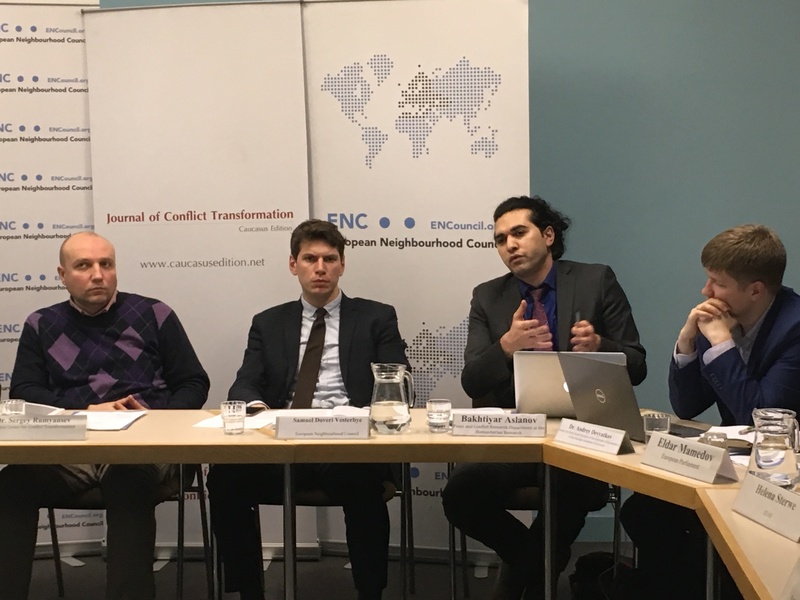 On the 7th of December 2017, the European Neighbourhood Council (ENC) held a roundtable discussion in partnership with Imagine Centre for Conflict Transformation and the Centre for Independent Social Research (CISR) for the launching of the second hard copy issue of the Caucasus Edition: Journal of Conflict Transformation, entitled “Visions and Strategies for Conflict Transformation: Dominant and Alternative Discourses on Gender, Militarism, and Peace Processes”. 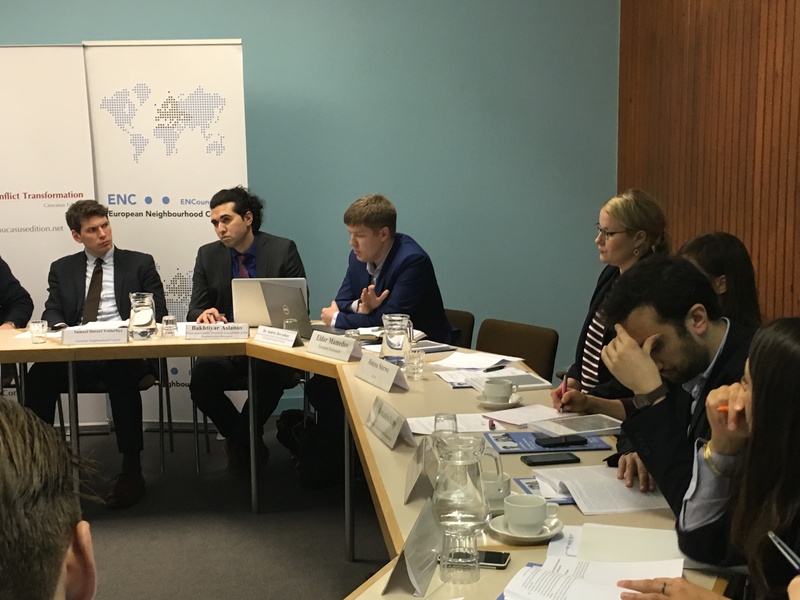 After the opening remarks of ENC Director Mr. Samuel Doveri Vesterbye, the first panel discussion started on the rise of militaristic sentiment and patriotic discourses, political parties and movements and the representation of minorities in the media, with Mr. Boris Iarochevitch, from the European External Action Service (EEAS), as rapporter of the discussion. 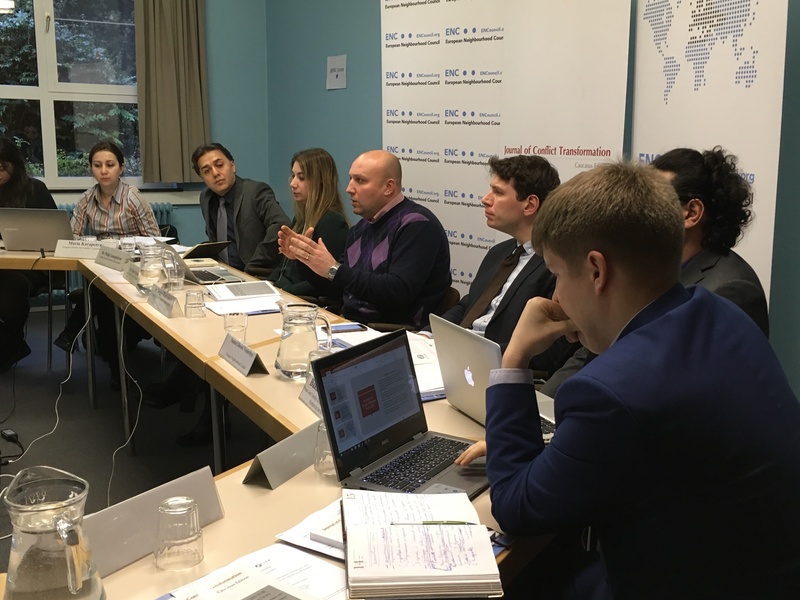 Dr. Sergey Rumyansev, co-founder of the Centre for Independent Social Research (CISR) and editor of the report, began the discussion by describing how the escalation of the clashes in the Middle East and the post-Soviet space was complemented by a change in the military and official discourses. Dr. Andrey Devyatkov, from the Centre for Post-Soviet Studies of the Institute of Economics of the Russian Academy of Sciences, continued the discussion presenting his chapter of the journal on understanding Russian behaviour and the Kremlin’s internal and external policy, presenting the “status quo power” of Moscow and its “reactive foreign policy”. 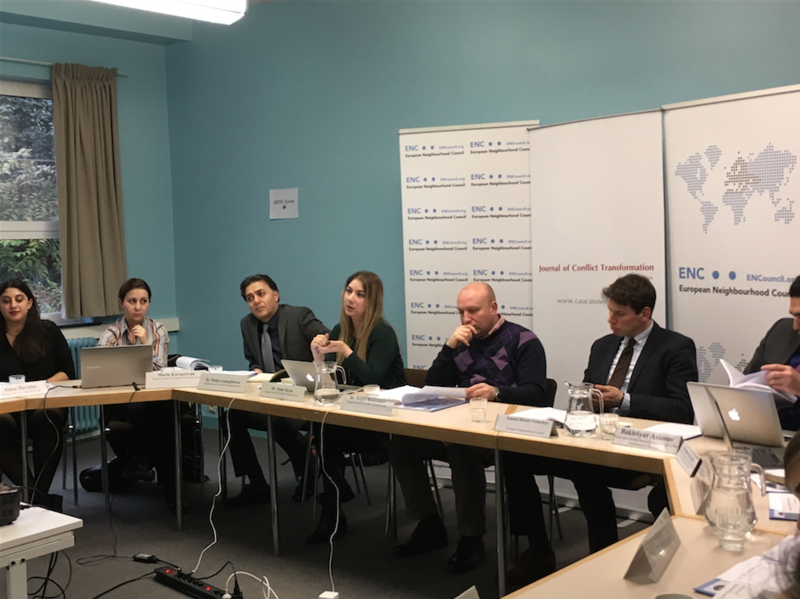 Shifting to another dimension of triangle ‘conflict, militarism and politics’, Ms. Maria Karapetyan, from Imagine Centre for Conflict Transformation, stressed that only one party in Armenia upholds a “proactive” approach in relations with Turkey and Azerbaijan. 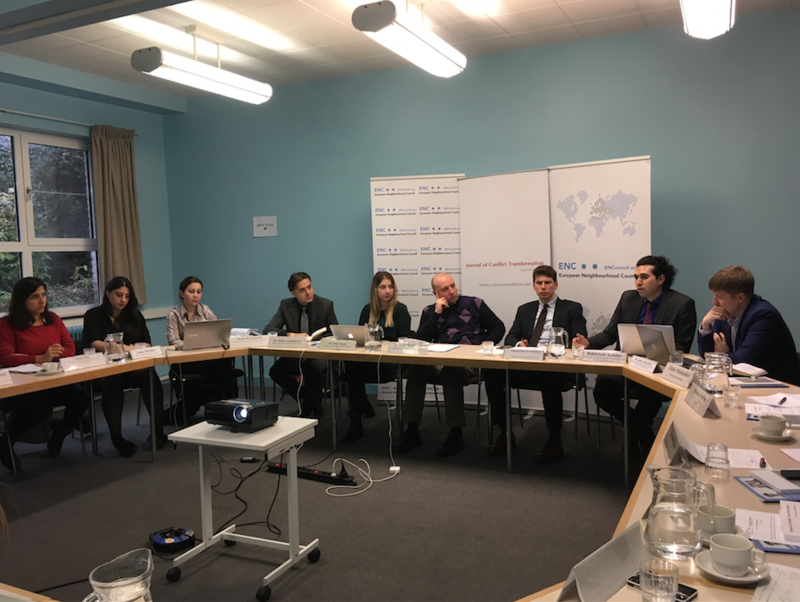 Mr. Bakhtiyar Aslanov explained then how the resolution of the conflict in Azerbaijanis kept in the political parties agenda as it is strongly connected with the human rights issue, the restoration of territorial integrity and of the Azerbaijan’ sovereignty. 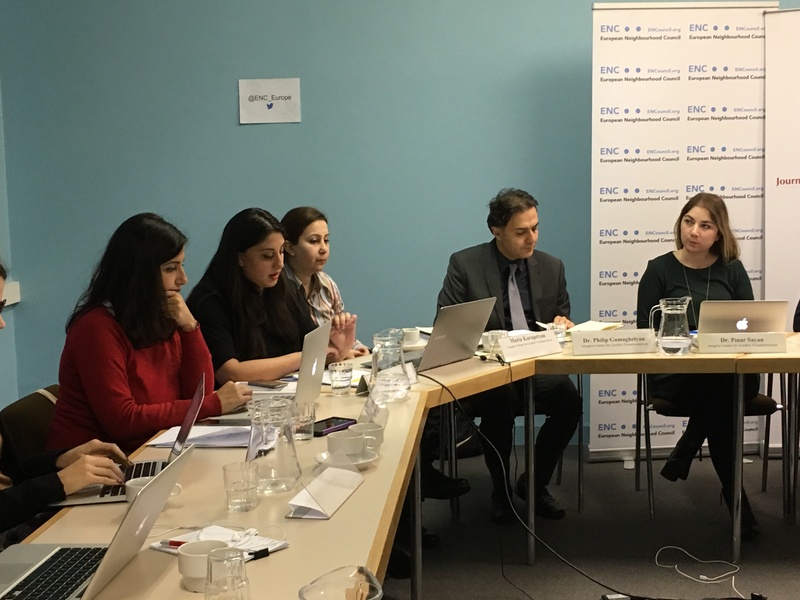 Dr. Pınar Sayan, also from Imagine Centre, closed the first panel discussion with an in-depth analysis of minorities and their representation in the media in Armenia, Azerbaijan, Georgia, and Turkey. The second panel of the discussion focused on gender, alternative peace process resolution and future visions for conflict resolution, with the presentations of Ms. Anna Iluridze, Office of Public Defender of Georgia, Dr. Philip Gamaghelyan, Imagine Centre for Conflict Transformation and Ms Nisan Alıcı, Demos Research Centre for Peace, Democracy and Alternative Politics. 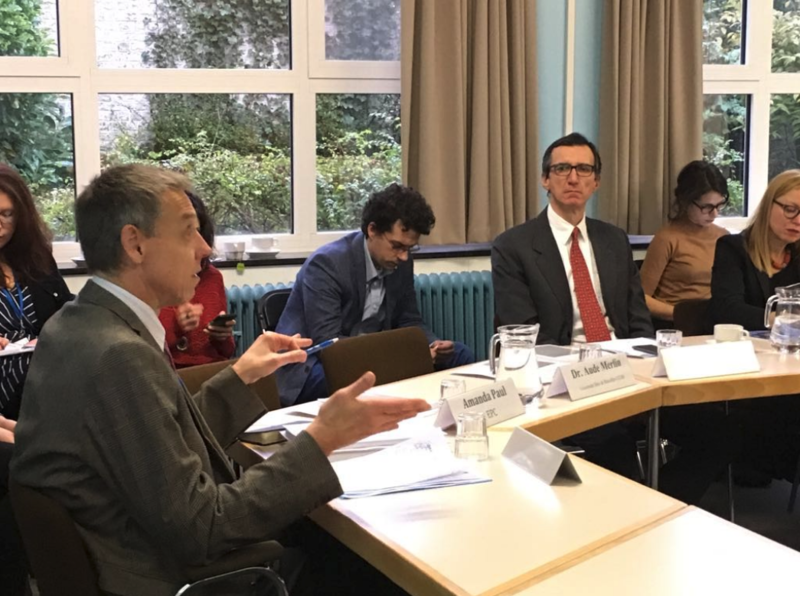 Prof. Bruno Coppieters, Head of the Department of Political Science at the Vrije Universiteit Brussel (VUB) was the rapporter of the discussion.